This story of hope and transformation is told by Alice Simutowe, a Northrise graduate and current educator and Program Coordinator for the School of Theology at Northrise University. Every parent boasts of being a “proud parent” when their children succeed. I felt the same when I saw our daughter, Dorcas, graduate with a Bachelor’s degree in Business Finance and Accounting on June 2nd, 2018 from Northrise University (NU). I had mixed feelings at that particular defining moment in our daughter’s life. 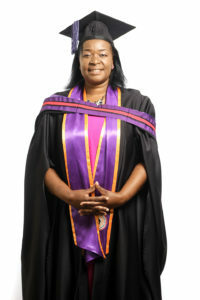 We beamed and cheered and applauded as they called Dorcas to receive her degree. No one could imagine what was actually going on in my mind. Dorcas is the fifth member of our family to graduate from NU. We also have two nephews currently studying at NU. 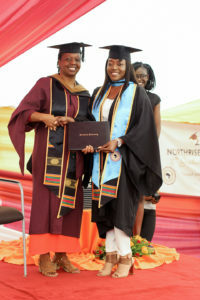 Northrise University has been an important name in our household since 2005 when my husband and I prayerfully decided on a university that was in its inception and seemly insignificant in the eyes of many residents of Ndola at that time. In my family, I was the first graduate from NU with a Diploma in Christian Ministries in 2006. Later I earned a Bachelor’s in Theology in 2009. In the same year, NU employed me as its first Registrar Associate. Since that time, I have served in many positions at NU. There I've experienced the blessing of countless opportunities to mentor and educate numerous students. My family’s story is one of God’s faithfulness. We could not have acquired these great achievements without God. I look back to February of 1997, when I lost my first husband, Ian. I was turning 29 years old and we had been married for only eight years. Life was wonderful and promising before that fateful event. A dark cloud seemed to cover my three little girls, ages 7, 6 and 18 months, and me. The youngest of my three little girls was Dorcas. At that time, I was working as a Health Inspector in Lusaka, the capital city of Zambia. My late husband had a senior position of Chief Administrative Officer. He was a very industrious, business-minded man. He was the bread winner of our family. I worked because I loved my job, not to provide for our family, because my salary at that time was very small. Ian’s death and the struggles that followed can be left to one’s imagination. In Zambia, property-grabbing from widows was rampant at that time. And my case was no exception. I thank God for the wisdom he gave to Ian to put some property title deeds in my name. At least we were left with a roof over our heads. With God on my side, my three little girls to support, and a job to help make ends meet, I gathered some courage to confront the future without a husband. I struggled, but through hard work and prayer, I was thankfully promoted to a management position at work and life seemed to improve. In 2001, I met Terrence and married this wonderful, Godly pastor. He has been by my side since then and a pillar of strength for our children. 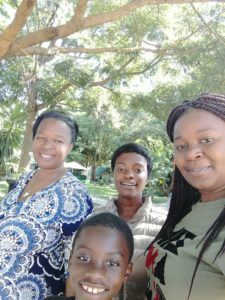 I relocated to Ndola with my three little girls to join my husband. Terrence is such a passionate pastor who has done ministry since the time he was a young man. He graduated from Trans-African Bible College where he obtained his diploma and later his Bachelor’s degree in Theology. If there has ever been a man who has lived by faith in God, even when it seemed like nothing was happening, it is Terrence. Terrence’s story is equally heart breaking in that he was also previously married, had a young daughter who died, and later on his wife died while giving birth to their second baby, who did not live longer than a month. The first time I met him, he had been widowed for close to five years. Our story is a miraculous story all together. In 2003, God blessed us with a wonderful son, Taizya. He is currently in Grade 10 at one of the technical schools in Zambia. Our family grew and we experienced challenges, but ministry was at the core of our being. My desire to serve people led me to the doors of Northrise University in 2005. All I wanted was to obtain training that would help me faithfully serve in ministry while I allowed the Word of God to work in my own life. As a pastor’s wife, people trusted me with their daily challenges. They opened up to me and shared the difficulties of their life’s experiences. I could pray and share the power of the Word of God with them, but in some instances, I still felt inadequate. Unlike my husband, I was not trained in pastoral ministries. I was just a Christian who loved God since the age of 12 when I gave my life to the LORD. Little did I know that God was going to open doors for the rest of my family members through that one decision we made for me to begin my education at NU. Northrise has empowered my family and restored the decency of family life back to us. As a woman, wife, mother, and mentor, I received a rare opportunity to work at NU and advance my academic education for the purpose of impacting the lives of students. The educational and financial empowerment that my family has so far received from NU enables us to help our extended family and church family. We have gladly financed their education at NU with the support of Financial Aid and other benefits that come with being part of the Northrise family. Today, I can gladly declare that Northrise University helped to empower our three little girls into responsible, working women. They are diligently contributing to the development of this nation. 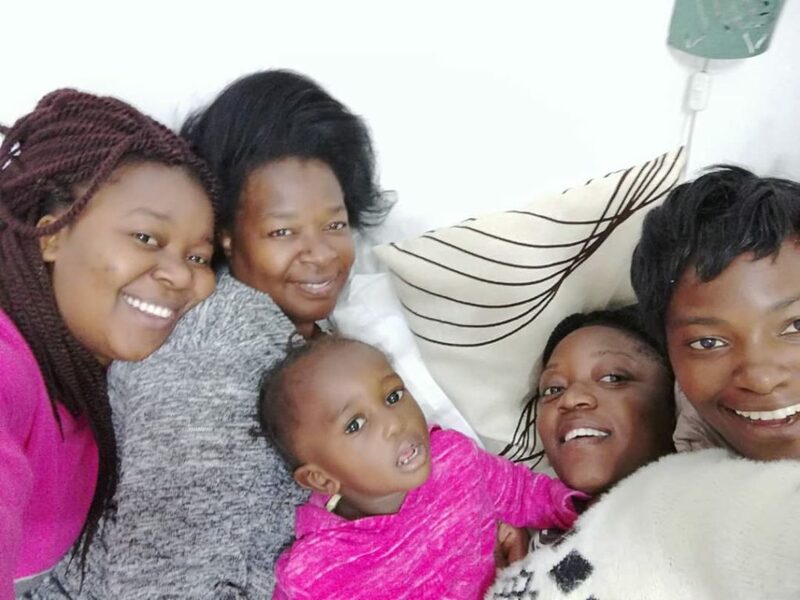 Chileshe, our first born daughter, obtained a Bachelor’s in Business Finance and Accounting and is currently assisting at ALMS, a non-profit ministry affiliated with Northrise University. Margaret is working at Kalumbila Mines in Zambia after obtaining her Bachelor’s in Business Administration. Dorcas, with her Bachelor’s in Business Finance and Accounting, is working in the Accounts Department at NU. My nephew, Misheck Nyirenda, is currently working at a travel agency, Voyagers, after graduating with a Bachelor’s in Business Administration. He is instrumental in supporting his young brother, David, who is pursuing a Bachelor’s in Theology at NU. My husband and I are currently sponsoring two students at NU. The ripple effect is endless. Indeed, our family's story of faith and challenges is Northrise’s story of success and being excellent at what is good. It is at NU that I have come to learn that excellence is not an event, but a lifestyle. Northrise University has managed to transform the lives of our children into well-trained and educated women! We are humbly grateful to God, to Northrise, and all the friends of Northrise. 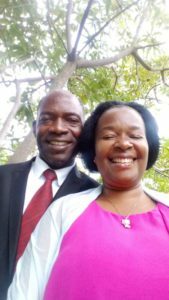 To Dr. Moffat and Mrs. Doreen Zimba, thank you for that first step of faith you took to believe God. To God be the glory! Northrise is this precious gemstone imbedded in our family’s heart and in the hearts of many generations. We are Northrise! In closing, I want to encourage all friends of Northrise to continue to impact the lives of the next generation. At Northrise, Christ is at the center, transforming our lives as lecturers, support staff, students, sponsors, families, etc. Let us all continue to invest in the lives of young men and women. A Northrise education leaves a lifelong impact. The next generation will face many difficult decisions, but a Northrise education will point them to God as the author and finisher of their faith. Let us continue to strive to raise a generation that will stand firm in this world. Being excellent at what is good. That is what Northrise is all about!